The interest in the A318 comes as the carrier continues its fleet modernisation and moves across from Boeing to Airbus models. After first introducing an A320 into its fleet in 2013 it now operates three examples, and these will be joined by other variants from the aircraft family over the coming years so it operates a variety of sizes of aircraft with all different capabilities, range, performance etc but with fleet commonality. UK ACMI and airline sub-charter specialist, Titan Airways is interested in becoming one of only a handful of airlines to fly the Airbus A318, the smallest member of the Airbus A320 short-haul aircraft family. The news was revealed by the airline’s commercial director Alastair Kiernan during an interview on the sidelines of the World Routes network development forum in Durban, South Africa. “We are to acquire an A319 as part of this modernisation for delivery in spring 2016,” Kiernan revealed to Routesonline, “while we aim to have an A321, subject to ongoing negotiations in place by summer 2016.” These aircraft, he said, will be configured towards the upper ends of the 144-150 seat window for the A319 and around 220 seats for the A321 to maximise the market opportunities for operation. Titan is looking to place the aircraft on longer-term ACMI leases and selected Airbus due to “the range of size of aircraft on offer in their narrow body portfolio”. The interest in the A318 is driven by the carrier’s interest in supporting independent tour operators on niche operations. “The A318 is something under real consideration. We could be one of only a few airlines to fly the aircraft, but it suits our business needs. We are not committed to this growth but would be interested if any aircraft come onto the second-hand market,” added Kiernan. The airline is seeking to raise its profile among the world’s airlines and is attending this year’s World Routes forum to further develop relationships, including those established by attending the Routes regional event calendar to interact with airlines in specific regions. 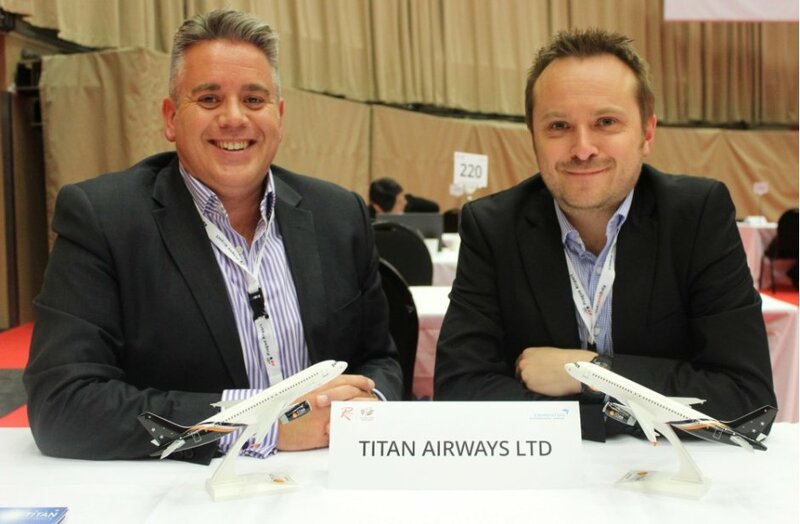 “My aim is to generate more interest in assisting airlines who require additional capacity, wish to have a backup plan in the event of AOG or operational issues, require coverage of maintenance inputs and to get the name of Titan Airways out further afield as we are not yet so well known outside of Europe,” Alex Harrington, business development manager, Titan Airways. To overcome these variations, Titan maintains a good mix of short / medium term ACMI lease and rapid response sub charter so they can react quickly to market conditions. “Providing aircraft at short notice is something that we specialise in and we are usually the first port of call for urgent airline sub charter requirements,” he added. Founded in 1988, Titan is an established player in the European charter market, providing bespoke charter flight services. Besides the ski tour operator flight programmes, the airline operates a summer flight series on behalf of a variety of travel and cruise companies as well as private charter flights for a diverse customer base, including personalities and companies from the music and film industries, international sports stars and teams, royalty and heads of state, government delegations, senior business executives and corporate events groups. It also supports the scheduled airline sector and many leading airlines – legacy carriers and regional airlines - call on it to provide instant operational solutions. The airline’s reputation is built on its unique ‘Go Now’ policy, which guarantees that an aircraft can be airborne within 60 minutes of flight confirmation, while its fleet, which includes three Boeing 737-300QCs; two 757-200s; a Boeing 767-300ER and three Airbus A320-200s, is also available to other airlines for short, medium and long term lease requirements.